If you are fascinated by how ideas ripple through human communities – you probably already read Malcom Gladwell. If not, check him out. http://gladwell.com/ He is a fascinating thinker and writer. He wrote The Tipping Point in 2000. I bought it at Goodwill a couple months ago. A lot is dated; this book is pre-smartphones! That said, The Tipping Point is really good! Why do you know who Paul Revere is but not William Dawson? Why was Sesame Street more popular than any kid show that preceded it – but then Blues Clues was even MORE popular? NYC in the middle 1980’s had one of the highest crime rates in the country. They made some changes that affected comparatively few people, yet the crime rate fell. How did that all happen? Gladwell want to determine where the “sticking point” of a movement happens. To analyze this he suggests we look at three “rules”. 1.The Rule of the Few. Ideas start when a few particular people latch onto them. Who are these trendsetters that start things? Gladwell dives into describing people who are CONNECTORS – people who know a LOT of people, who are a part of a LOT of varied groups. Think of a gregarious friend who has a job in one industry, goes to a bustling church, is active in a community organization, belongs to a sailing club, and goes to occasional conferences or meetings for a political cause. That person is comfortable around people- and knows a LOT of them. He or she is a connector. MAVENS are humans who know a whole lot about some subjects and they want to share their knowledge with you. They are at the leading edge in the subjects they care about. SALESMEN (I’m sure 17 years later Gladwell would find a way for this to not be a masculine designation) are fascinatingly gifted at convincing you to do things their way. There is an intriguing section in the book explicating the research into what makes us want to do what someone else tells us to do. It comes down to micro-tips of the head and shoulders, inflections in the voice, length of eye contact. Much of it seems almost instinctual but it is very, very powerful. Stickiness is hitting people exactly where their interest and comprehension resides, then building on and repeating that concept until the kid – or the voter – or whomever we are trying to influence –understands the message and is ready to take in additional thoughts that bolster and compliment it. Consider religious scriptures. All of them can be read as a child and they will make some sense. But they are intriguing enough that they can be read and studied over and over and over. They have a “stickiness” that keeps one engaged. Look at the ideas around us that have “stickiness”. 3. THE POWER OF CONTEXT. We are more likely to accept ideas that come to us in certain environments and sizes. Mid-1980’s NYC attacked graffiti. Many people criticized this as ‘small potatoes’ compared to the violent crimes holding the city hostage. Yet that deliberate goal (with other things, not just the graffiti-eradication) made the subway system appear more welcoming. So more people rode it. Which made it safer. The accommodation we make to utilizing each other’s gifts and expertise has an outside limit; we do best in groups of about 150 people. Once again, Gladwell presents the research that explains why this size works with our brains. But consider it anecdotally. What groups have been most exciting, energizing, and productive for you in your life? Companies of 150 people, where you knew almost everyone? Your church? 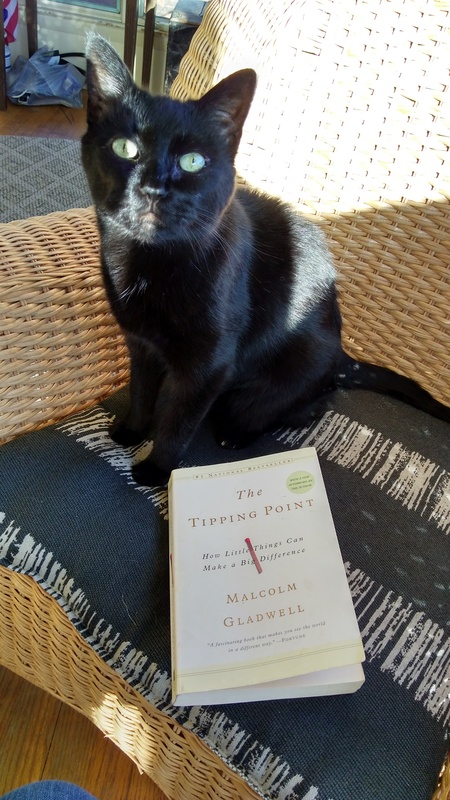 If you care about analyzing or affecting society, The Tipping Point is an interesting read. Thanks for including the AAUW Book Sale in your column and ad. The sale will be better than ever this time. Tons of books and so well organized. I appreciate your book reviews. This is going in my bullet! This is going in my bullet! On my list of what to read. That's a beautiful cat you feature so prominently with this book review.